Lucy Healy-Kelly takes a peek at a new arts and literary journal, and talks to fellow Corkonian Katie Raissian about what it’s all about. How It’s New York: A gathering of young Brooklyn-based women involved in the arts have just brought out the first edition of a new literary and art journal called Stonecutter. How It’s Irish: Editor-in-chief Katie Raissian hails from Cork and this first issue includes work by Dublin-based poet Anne Fitzgerald. It also features a retelling of an old Irish myth, in Eliot Weinberger’s Islands in the Sea. The journal will continue to have an international focus, with more Irish writers slated for the next edition. In a world, or at least a world wide web, in the thick of a blog explosion, it has never been easier to have your voice heard. Writers of all kinds can reach an audience across the globe with the click of a mouse, and minute by minute the internet is flooded with literary endeavours of all kinds. Sometimes it can seem like the days may be numbered of reading something made of paper, with pages that you turn with your own two hands. This week sees the official launch of a new biannual literary journal that nudges its way into the world against this wave of ezines, electronic books and vanity publishing. It is made of good old fashioned paper. Its battery will not run down. You can put it in a bag, or on a shelf. Its resolution is excellent, and it’s even in 3D! 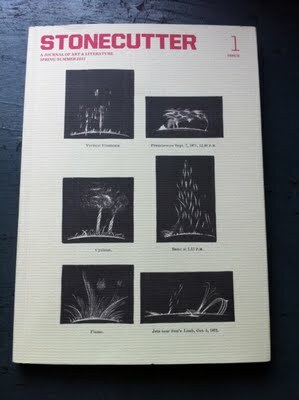 A slim volume with offset printing, heavy stock, french flaps and a four colour insert, Issue One of Stonecutter: A Journal of Art & Literature is a pleasingly elegant 106 page journal, whose very existence seems to fly in the face of the dismal downturn of old-fashioned print media. This is not a book to be judged solely by its cover though. Katie, who moved to Brooklyn in 2009 with her husband Chris Russell (the talent behind the journal’s beautiful hand-drawn contributor illustrations) has long been a lover of literature and print, and these two loves were part of what prompted the idea for putting Stonecutter together. “When I came here I interned at Ugly Duckling Presse in Brooklyn, and also worked for a time at New Directions. Through those two experiences I got a feel for what was going on in independent literary publishing both in New York and greater America,” says Katie. She discussed the idea of starting a journal with her good friend and poet Ava Lehrer, whom she met interning at Ugly Duckling, and their similar ideas about poetry, as well as a mutual passion for the project, saw the editorial process begin about a year ago, with Ava on board. Soon, Katie recruited a larger editorial team. Poetry was always just one element of the vision for Stonecutter. According to Katie, “I wanted to start something that was an all-encompassing venture; a journal that didn’t belong to a specific genre or style. I also wanted it to be a project run by women and therefore bring to the fore a new female editorial voice.” The volume contains some truly arresting poetry, prose, photographs and illustrations. At first glance it may seem an eclectic mix, but it was important to the team that not only could each inclusion be read or appreciated as an individual piece, but that there would be an intricate exchange between each of its parts. The Stonecutter team approached writers and artists for contribution whose work they admired, and received a unanimously positive response when they told them about the project. Open submissions were also solicited online. The result is a mix of both well-known and lesser-known names. Familiar and highly regarded writers include Robert Kelly, Eliot Weinberger, Jen Bervin, Alan Gilbert, Charlotte Mandell and Jeffrey Yang. Award-winning Australian poet, Sarah Holland-Batt, currently in New York on a Fulbright Scholarship, has three poems appearing in the issue. Andrew Gorin, Emily Skillings and Jocelyn Spaar represent just a smattering of the emerging talent published in the issue. All work by this mix of established writers and relative newcomers is previously unpublished. Of course, Stonecutter aims to represent not only the written word but also visual art, and it was important to chose images that worked well alongside their text-based companions. Zara Katz is a photographer and Stonecutter’s art editor, who was taken by the work of Newsha Tavakolian, an Iranian photojournalist by profession, whose rich work crosses boundaries into fine art photography. 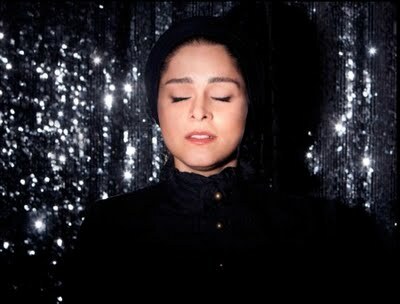 The issue includes a series of portraits from her new collection, Listen, that focus on professional female singers who are prohibited from public or solo performance in their native Iran. These striking images capture the women midsong, eyes closed, in dreamlike poses which fuse both the oppression and the escape which their situation presents. 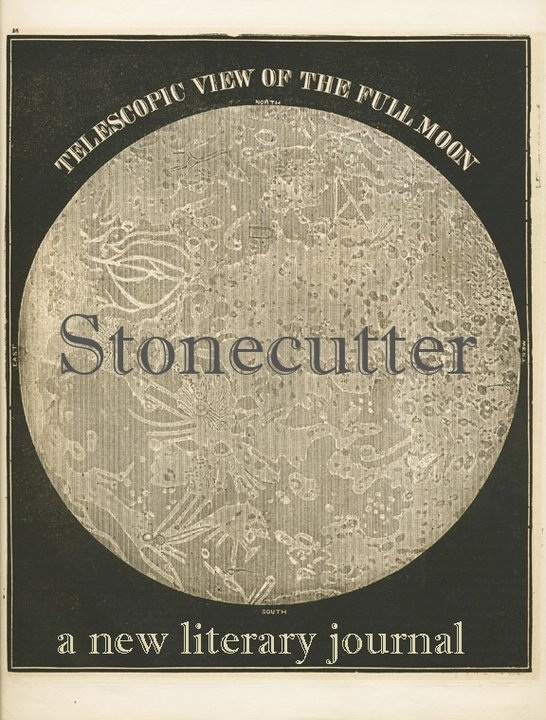 Stonecutter Issue One is priced at $12 and is available through the website www.stonecutterjournal.com. It can ship to anywhere in the world (post and packaging costs are extra.) Annual subscription is also available. Stonecutter will also be available at select bookstores in New York. 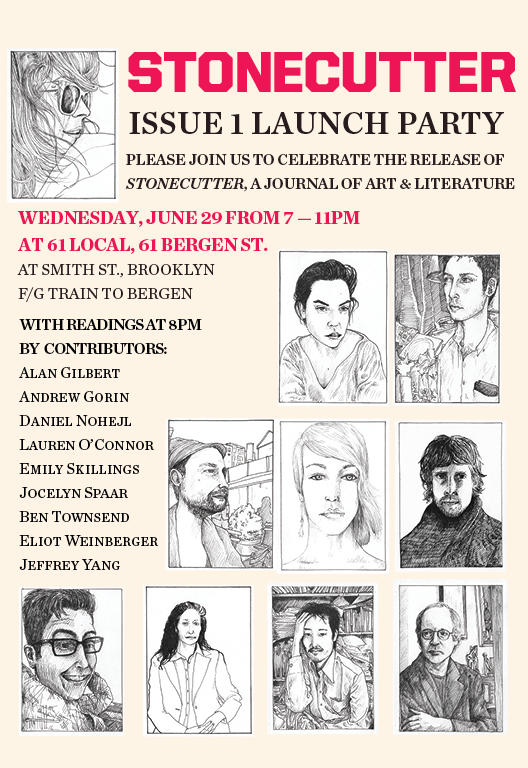 The Issue One launch is open to all and is being held at 61 Local in Cobble Hill, Brooklyn, on Wednesday the 29th of June, from 7pm-11pm. Can’t wait til my subscription arrives! Kudos to a great team for this launch.